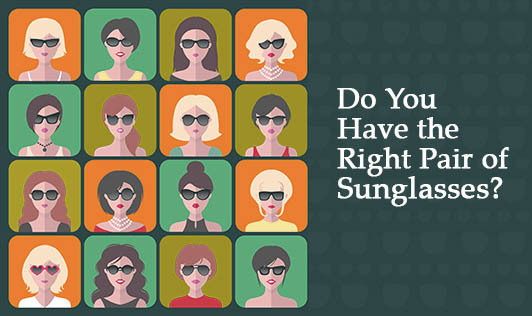 Do You Have the Right Pair of Sunglasses? We know the importance of sunglasses during the summer. The UV rays from the sun are intense all year long. Polarized sunglasses provide the protection during winter when the heat from the sun may be weak but the UV index is high. Extended, un-protected exposure to UV rays, can lead to a number of different ailments like cataracts, macular degeneration, loss of vision and even cancer. •Insist on 100% UVA/UVB protection. •Make sure the sunglasses fit properly. •Choose the right hue. Go for gray, green, and brown lenses which minimize color distortion. •When children are very young, look for sunglasses with straps or ear pieces that wrap around the ear. •Kids with prescription eyewear should have prescription sunglasses or sunclips for their regular glasses. These tips should not be taken as rules but they can help you to choose a right frame. 1.Oval face- Any frame shape. Almost any style works for oval face. Square shaped frames with gently rounded edges and higher temples also look good on an oval face. 2.Round face- Wider frames with angular/rectangular styles. Frames should make the face appear longer and thinner. Look for frames equal to or slightly wider than the broadest part of the face. Minimize the curves and choose soft, angular, rectangular styles or double-brow styles. 3.Diamond shape- Oval, Square, Rimless frames. This face shape has wide or high cheekbones with a narrow forehead and chin. Oval glasses will soften the contour of the face, although softly curved square frame will work as well. Make sure the styles are no wider than the top of the cheekbones. 4.Square face- Oval, Round, Cat eyes frames. This face shape consists of a strong jaw line, a broad forehead and wide cheekbones. Reduce the angles with soft, curvy styles such as cat-eye styles. The classic ovals also work well for this face shape. 5.Oblong face- Round, Square frames. Widen and shorten the face with sunglass styles that do not extend beyond the widest part of the face. Round or square shapes will look great on this face. Frames with short horizontal and long vertical lines also work. 6.Triangle shape- Straight top line, cat eye frames. This face has a narrow jaw and a wide forehead. Soften the lower portion of the face by accenting the eye area. Styles such as cat-eyes should angle outward at the top corner and be wide enough to balance the jaw line. You can also try metal frames with rimless border.